Occupational therapy focuses on a variety of physical and functional impairments. One main components of OT intervention is upper-body strengthening. 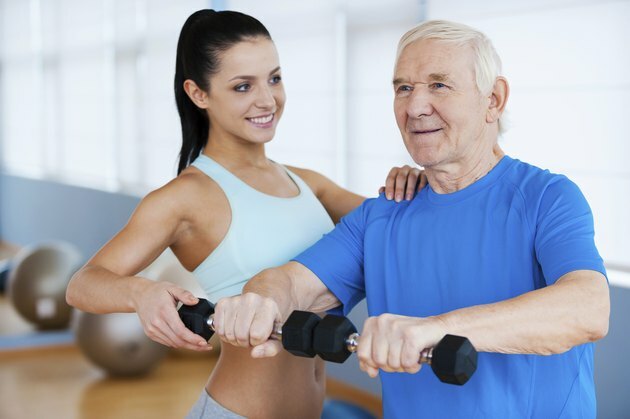 In conjunction with traditional weighted exercises, occupational therapists also use therapeutic activities to improve your muscles strength and endurance. These activities can also target additional issues such as problem solving, safety, balance and direction following. By understanding the purpose of the tasks your occupational therapist provides, you can appreciate the functional outcome associated with the otherwise non-functional tasks. Tossing a ball is generally considered a children's task. However, your OT may use a modified ball toss to help strengthen your muscles. Initially, by tossing a lightweight ball, like a beach ball, you can increase your range of motion and basic strength. As you advance, your therapist may use a heavier ball or weighted cuffs around your wrists to increase the intensity. For maximal strengthening, tossing a medicine ball while standing will provide significant total body strengthening. As you initially recover, your muscles will fatigue with simple activities such as putting pegs into a hole or twisting nuts onto bolts mounted on a board. To further increase your strength, your therapist will challenge you by adding sequentially heavier weighted cuffs to your wrists while completing these tasks. By increasing the time you perform the task without a rest, you can improve your muscle endurance as well. Standing while focused on completing a fine-motor task will also strengthen your leg and balancing muscles which can reduce your risk of fall during functional activities. In addition to traditional dumbbell exercises, your occupational therapist will use an arm bicycle to improve your arm strength. Beginning with several minutes of arm cycling at a time, your therapist will add intensity by turning up the cycle's resistance or by increasing the amount of time before a rest break. This opposing arm movement is also associated with increased balance while walking because it simulates the opposing arm movement. As your arm muscles are strengthened, you can begin to participate in more functional tasks. Your therapist may have you fold laundry to further strengthen your muscles. By folding a large item, such as a comforter, your muscles can get stronger. Additionally, your therapist may have you wear weighted cuffs while you sit and fold laundry. Your overall increased muscle strength and endurance will allow you to physically participate in functional life activities such as meal preparation and getting dressed.